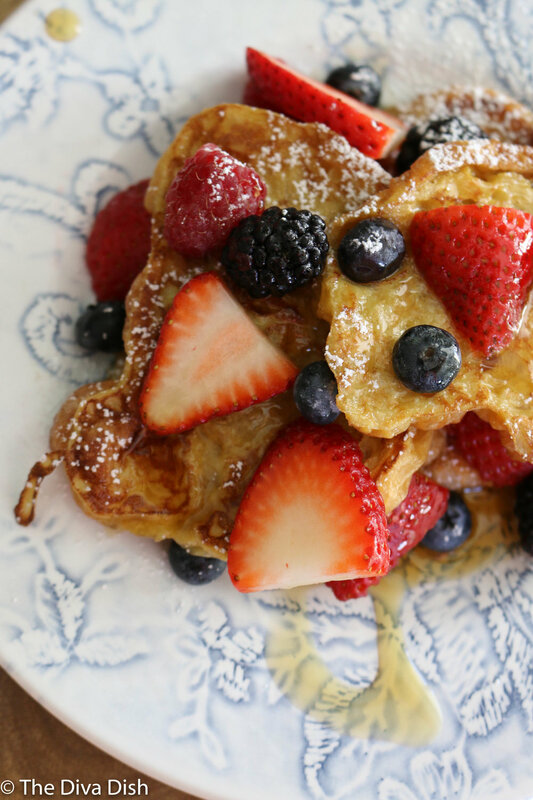 *If you are looking for the perfect 'tradition' breakfast, this Croissant French Toast is the perfect recipe! * I know how it is friends. You try and make one meal for the whole family, and all of the sudden everyone turns into food critics/has an opinion/all of the sudden hates their favorite food called mashed potatoes. Usually on the weekends we will make a more grand breakfast, like pancakes or waffles. Trust me...It's not all fancy cakes and smiley pants. One child doesn't want a pancake, they prefer a waffle. The other child enjoys the pancakes, but only takes two bites. The baby throws hers on the floor, and my husband doesn't care for the fact that they are whole wheat. He decides he would rather have toast and chocolate milk. Cool. I'll just be here in the kitchen all day guys, DON'T WORRY! Over the years I've obviously learned to tell my family how much I adore them, and if they don't like it well, that's too bad. But it still doesn't mean they turn in to the Leave It To Beaver family around meal times and say, "Gee Mom, this was delicious. You are the best cook." June had it so easy. Sadly, I don't remember the last time I wore pearls and I rarely vacuum. I'll never be June Cleaver, but I would like to hire her once a week. That being said, I like to share recipes that everyone enjoys, because WWJD? What would June do, right? This Croissant French Toast was a tradition I started a few years back. If you read the list of ingredients, it's not the healthiest. In fact, it's not healthy food wise at all. But we eat this traditionally 2 times a year during LDS Conference, or when we have special guests in town. It brings everyone together, and it's something that EVERYONE enjoys! In my opinion, it's definitely a part of living a healthy lifestyle. This didn't go down without a fight though, I might add. It all started when the family wanted french toast, but we had no bread. Only a box of croissants, because we are fancy and sophisticated. My husband, who apparently is a french toast connoisseur, said this was a mistake and would never work. Although my husband made me french toast in college one time when we were dating making him master french toast chef, I had to ignore his suggestion and go with my gut. The rest is history, because we look forward to this breakfast every conference! In a shallow dish, wish together the eggs, milk, vanilla, brown sugar, and salt. Heat griddle on low/medium heat, and coat with butter. Dip halved croissants in egg mixture, coating and soaking both sides. Place them on the griddle, and cook on each side a few minutes, or until golden brown on each side. Don't press on them with a spatula. Serve immediately and top with butter, fruit, powdered sugar, and/or pure maple syrup. 1-If I find a meal that everyone enjoys, I will share it. 2-If you know where June Cleaver might be, would you give her my digits?